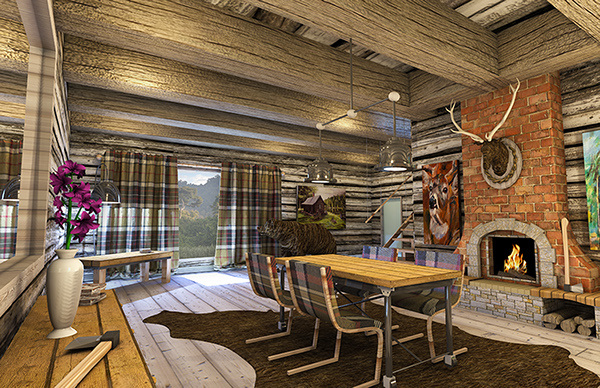 A Lumberjack's dining room, modeled in 3Ds Max Design and edited in Adobe Photoshop. The estimated time of modeling and editing was about 20 hours. The assignment was to model a dining room the professor had previously modeled, to become familiar with 3Ds Max. The lumberjack theme was my own twist on it, after discovering online 3d modeling resources, and from them the bear that it located in the background. So I decided the rendering needed to have the bear in it and the only logical thing to do was to turn the dining room into a lumberjack's home. Everything in the seen is modeled by myself except for the bear and dear head.